Dwarf, cluster flowered, Polyantha bush rose. Vigorous, compact, free branching habit and deep green leaves. Sprays of small, double, white flowers, about 4cm across, opening from red buds from summer to autumn. Beds, borders and containers. Can be trained as a small standard. 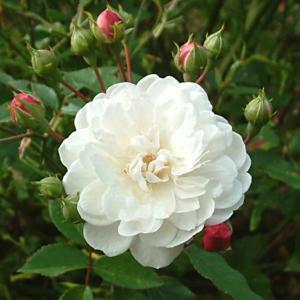 Useful small rose for restricted spaces, with a classic, old fashioned appearance.